Chris* is an associate with a broad litigation practice, specializing on corporate commercial and securities law matters. Chris thinks§ through legal problems aided by his previous background as a transactional lawyer where, prior to joining Lenczner Slaght, he focused on mergers and acquisitions and corporate finance and securities. This unique training enables Chris to think outside the box‡ when assisting clients in navigating through complex issues. 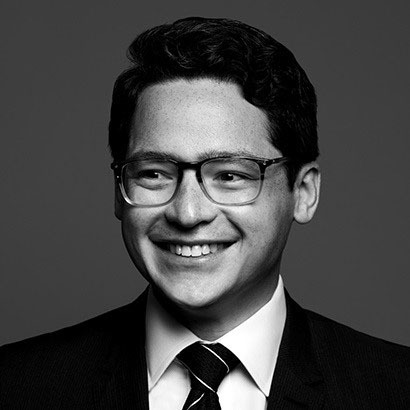 He combines his experiences in advocacy and legal analysis with a practical business perspective. .
Chris has a broad litigation practice, with a focus on commercial litigation, shareholder disputes and securities law matters. Prior to joining Lenczner Slaght, Chris practiced with a leading international Canadian firm as a corporate transactional lawyer in Toronto and London, UK, specializing in mergers and acquisitions, corporate finance, and general corporate commercial matters. Chris graduated with honours from the University of Toronto, Faculty of Law, in 2011. While in law school Chris participated in the 2010 Philip C. Jessup International Law Moot Court Competition, receiving an oralist award. Chris also received a course prize in Canadian income tax law, and studied a term abroad at the University of Hong Kong, Faculty of Law. Before attending law school Chris completed a masters in international relations at the London School of Economics, worked at NATO headquarters in Brussels, and at the Department of Foreign Affairs and International Trade in Ottawa. In September 2018, the U.S. Securities and Exchange Commission (“SEC”) charged Elon Musk, the former Chairman of Tesla, Inc., with securities fraud. A series of Tweets on Musk’s personal page, the first of which read: “Am considering taking Tesla private at $420. Funding secured”, caused share prices to instantly soar. In reality, the potential transaction was uncertain and subject to a number of contingencies. Market confusion and disruption ensued. Tariffs and protectionism have been hot topics in the law in 2018. While NAFTA negotiations and a growing US-Chinese Trade War dominate the headlines, the issue has also spread into domestic Canadian politics this year. Third place oralist, Canadian rounds. First place team, distinguished oralist prize.